The cooler regions, which emit light at longer wavelengths, are displayed in a red-brownish color. Hotter areas, where star formation is more intense, shine in blue and white tones. Some areas are particularly bright, suggesting a number of luminous, massive stars are forming there. The star-formation region in this image, centered around –70º longitude in galactic coordinates, is located in the Carina neighborhood, home to the glorious Carina Nebula. Located some 7500 light-years away, Carina is one of the largest clouds of gas and dust in the plane of the Milky Way. It hosts the famous Eta Carinae, one of the most luminous and massive stellar systems in our galaxy. Herschel, which operated from 2009 until 2013, was a large space telescope observing in the far-infrared and submillimeter parts of the spectrum. This spectral range is ideal to observe the glow from cool dust in the regions where stars form. 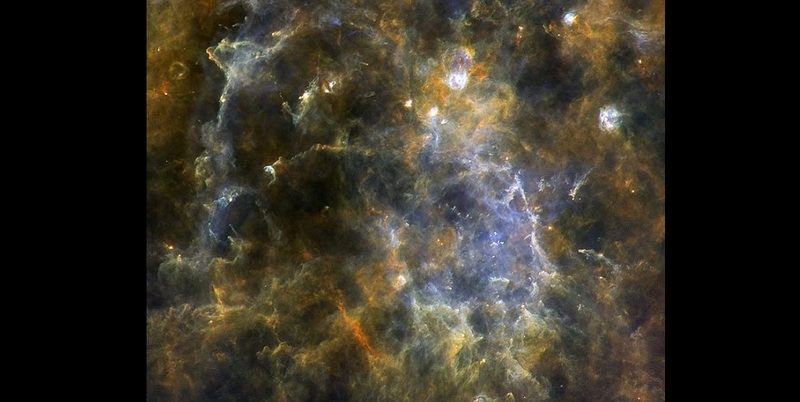 As part of Hi-GAL, the Herschel infrared Galactic Plane Survey, the observatory surveyed the plane of our Galaxy, exploring the Milky Way’s star-formation regions in unprecedented detail. This image, a product of Hi-GAL, combines observations at three different wavelengths: 70 microns (blue), 160 microns (green) and 250 microns (red).